Hubbells Miss Judy is a corner stone of herd. 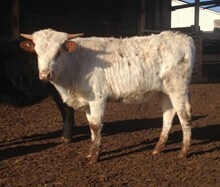 Her full brother is Gunsmoke of Lazy L Longhorns. Her dam, Delta Judy, had 70 inches tip to tip. Miss Judy has a bull calf at side by El Presidente.